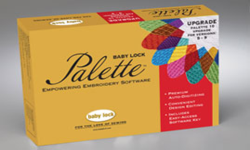 Create and edit embroidery designs with ease using the advanced technology of Baby Lock Palette 10 Creative Embroidery software. 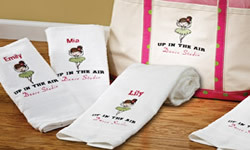 Choose from a variety of layout features and fonts to create truly customized embroidery. Palette 10 includes many features to make the production of even the largest projects fast and simple, with professional results. 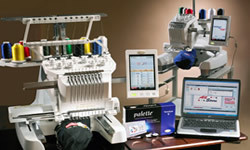 Several Baby Lock multi-needle machines can be linked to Palette 10 at once, allowing you to send designs directly and monitor the progress of multiple projects from your computer – perfect for businesses. The Name Drop feature lets you easily swap names and numbers in and out of designs such as team or business logos – Use up to 500 names. (Available on Enterprise 10-needle machine only) Split and create large designs for the Baby Lock Enterprise 10-needle machine by using the optional 14″ x 14″ hoop..
Split and create large designs for the Enterprise by using the optional 14” x 14” Hoop!